Catwalks 2 Mod includes Catwalks, Caged Ladders, Scaffolding, and Support Columns, each of which has both practical and aesthetic uses. Except for the Support Columns, they just look cool. 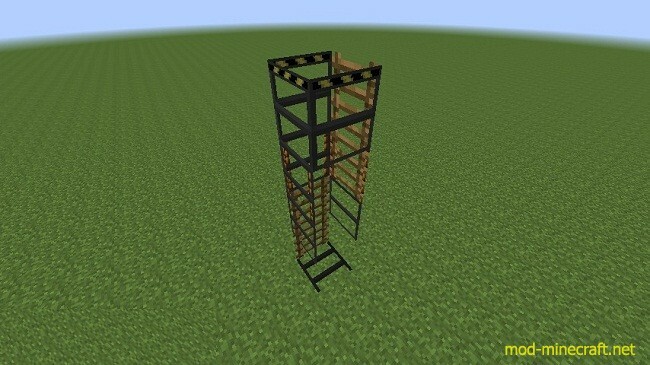 Caged Ladders can’t be fallen out of and can be climbed at almost 2x the speed of normal ladders. Scaffolding can be climbed like a ladder. They can quickly be placed, destroyed, extended, and retracted. When you use the builders’ variety, they act like tall grass where you can right-click them with a block and replace them. Support Columns mostly look cool. They technically are ladders but are so slow. They are pretty much useless as ladders. 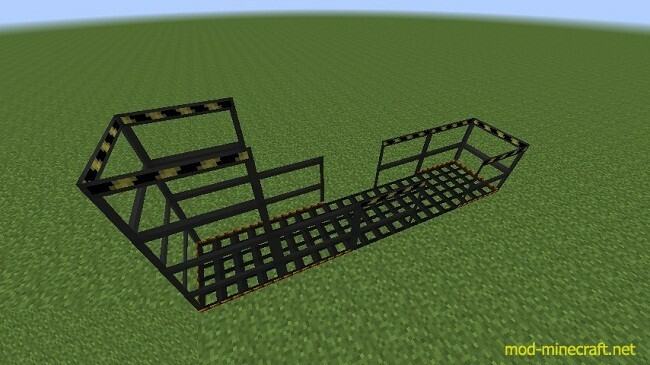 Sturdy Rails are self-supporting versions of normal rails that do not need a redstone signal to be active. Any of the blocks in this mod can be destroyed more quickly with a Blowtorch, or can be broken instantly and deposited directly into your inventory by shift+left-clicking with a Blowtorch. The sides of Catwalks can be enabled/disabled by right-clicking with a Blowtorch. When any side of the Catwalk is disabled, the hitbox becomes 1/4 block tall and completely invisible unless you are holding a Blowtorch. Right-clicking on the inside of the Catwalk will actually click on the outside, allowing you to place blocks on the outside of the Catwalk. You can’t jump over the sides of a Catwalk unless you’re sneaking. If they are in a vertical stack, Catwalks can be climbed like ladders. You can cling to a Catwalk that is in a stack by sneaking or holding a Blowtorch. If you are holding a Blowtorch, you can sneak to climb down. 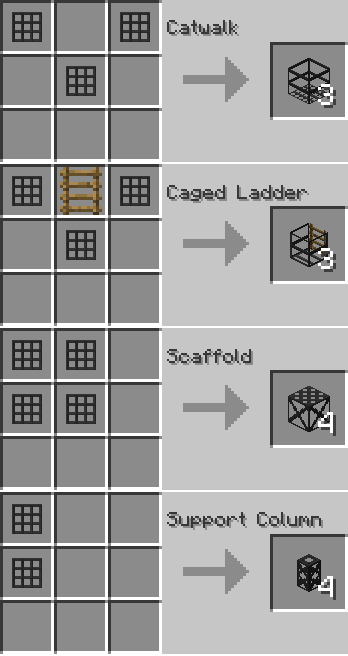 The sides of Caged Ladders can be enabled/disabled by right-clicking with a Blowtorch. When any side of the Caged Ladder is disabled, the hitbox will shrink to 1/4 block wide and be completely invisible unless you are holding a Blowtorch. 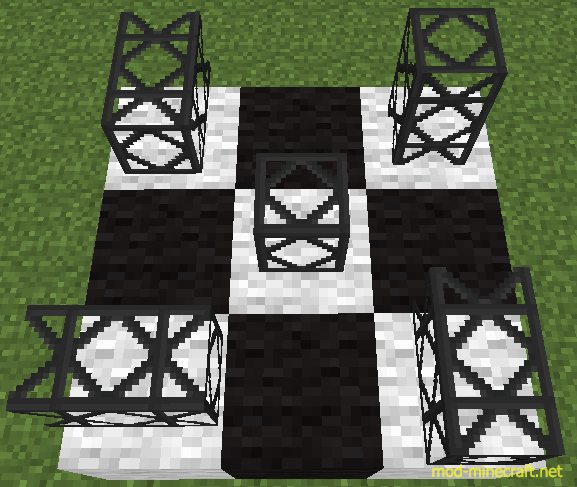 Right-clicking on the inside of the Caged Ladder will actually click on the outside, allowing you to place blocks on the outside of the Caged Ladder. You can cling to a Caged Ladder by sneaking or holding a Blowtorch. If you are holding a Blowtorch, you can sneak to climb down. By default, Support Columns are a full block in length along one axis. Support Columns will align with the side of the block they are placed on. Support Columns can be made “directional” again by right-clicking on them with a Blowtorch. This will align them with the side clicked. Support Columns are climbable as ladders, although they are much slower than normal ladders. You can cling to a Support Column by sneaking, holding a Support Column, or holding a Blowtorch. If you’re holding a Support Column or Blowtorch, you can sneak to slowly climb down. Support Columns can be extended by shift+right-clicking one with a support column in your hand. This will extend it direction opposite the side clicked. Support Columns can be retracted by shift+right-clicking one with a Blowtorch in your hand. This will retract it from in the direction opposite the side clicked. White stars if it encounters another line of Support Columns. Red stars if it can’t extend any further. Scaffolds will instantly break when hit. 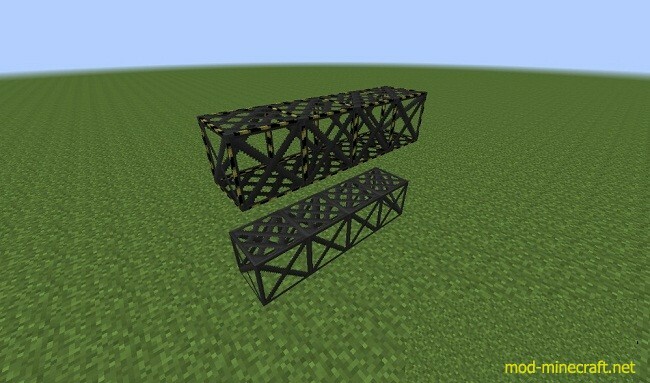 Scaffolds can be extended/retracted exactly like Support Columns, and will show the same particle effects. Scaffolds are climbable like ladders and are just as fast as ladders. You can cling to a Scaffold by sneaking, holding a Scaffold, or holding a Blowtorch. If you’re holding a Scaffold or Blowtorch, you can sneak to slowly climb down. Normal Scaffolds: These are just a normal block. Builder’s Scaffolds: Right-clicking on these with a block will replace the scaffold with it that block. Right-clicking a Normal Scaffold with a Blowtorch will toggle between the Normal and Builder’s Scaffold textures. Sturdy Rails act almost exactly like vanilla rails. There are Sturdy versions of all the vanilla rails. Sturdy Rails don’t need a block to support them and can’t be placed directly above another rail. 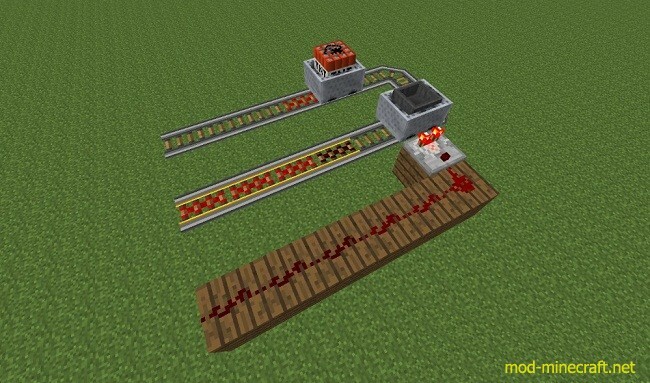 Sturdy Powered/Activator Rails don’t require a redstone signal, instead they are toggled by right-clicking with a Blowtorch. Right-clicking on the top of a Sturdy Rail with a Sturdy Rail in your hand will extend the rail line in the direction you are facing. 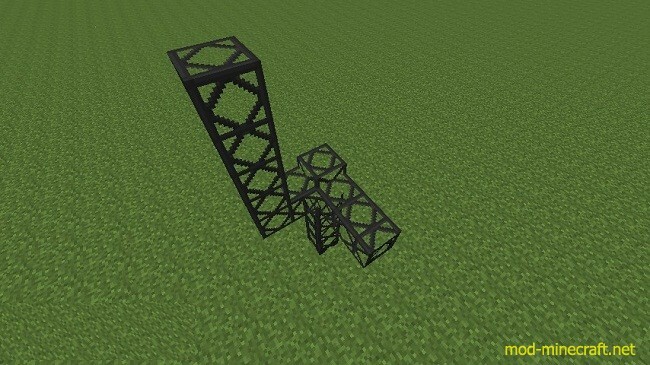 Sturdy rails will connect to normal rails. The Blowtorch is the configuration tool of the catwalks mod, although you should be able to use most wrenches interchangeably. 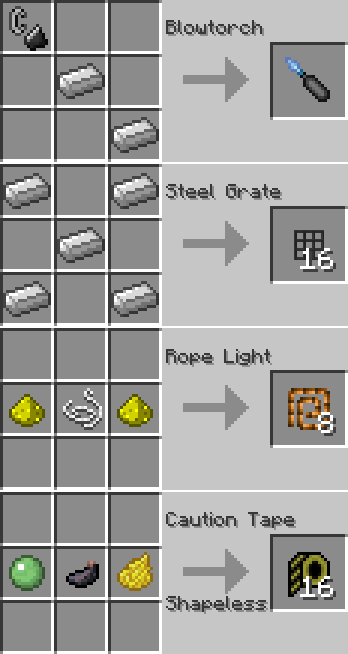 Rope Light can be added to a Catwalk or Caged Ladder by right-clicking. Rope Light will cause the block to glow and the texture to change. Caution Tape can be added to a Catwalk or Caged Ladder by right-clicking. Caution Tape will cause the texture of the block to change. Caution Tape can be removed from a Catwalk or Caged Ladder by shift+right-clicking with an empty hand-first removing the lights, then the tape.